Indian Head Massage or ‘Champissage’ has been a tradition with Asian people for thousands of years. Indian infants receive a daily massage. Indian women massage their hair with luxurious smelling oils, and Indian barbers will include a simple head massage during your visit. Today an Indian Head Massage involves a varying combination of gentle, soothing, brisk and stimulating movements to the upper back, neck, shoulders, upper arms, head and face. Indian Head Massage is wonderfully relaxing and energy giving, calming and revitalising, nurturing, cleansing and comforting. It is a simple, effective and versatile massage treatment carried out either with carrier oils (with or without pure essential oils) directly onto the skin, or performed over clothes. Tension in the muscles most affected by stress may be eased, reducing stress related conditions such as headaches. The treatment may assist lymphatic drainage and circulation encouraging higher levels of alertness and concentration. Hair and scalp condition may improve by relaxing and stimulating the scalp and nourishing the roots of the hair. Champissage may assist chronic neck and shoulder stiffness often brought about by poor posture. It may help unblock deep knotted muscles in the neck and shoulders. This type of massage may also help to improve circulation, tone up muscles, relieve eye strain, improve the immune system and generally revive your body. 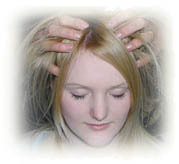 Indian Head Massage uplifts you psychologically – rebalancing you physically , mentally and emotionally. It helps counteract the stress and strains of modern day living, leaving you with a sense of well being and relaxation.